Peterborough United were made to "look like Real Madrid" by Scunthorpe United in Saturday's 4-0 defeat, says Iron boss Mark Robins. 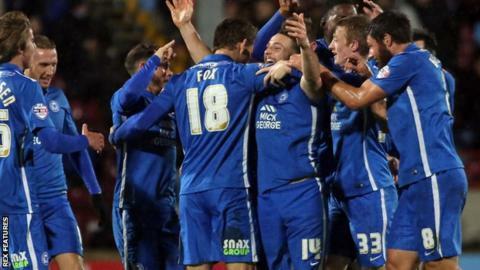 Scunthorpe conceded after four minutes, and Posh scored another three goals after half-time to seal Scunthorpe's third loss in four League One games. Conor Washington scored a hat-trick, with two of his goals coming in the last eight minutes. "It was totally, totally abject," Robins told BBC Radio Humberside. "We never turned up for whatever reason for the first few minutes of the game. They're a good team but we made them look like Real Madrid." Robins was angered by the nature of the goals against a side who have found the net more times than any other side in the top four divisions. "The four goals we conceded were really poor," added Robins. "The last two you're trying to press and commit bodies forward but we're still not good enough. "They found too much space and time and they have players who can hurt you. "We've got to move past it as quickly as we can because the next game comes round pretty quickly."